The utility of language resides in two questions: what’s upwind and what’s the best way to get there? 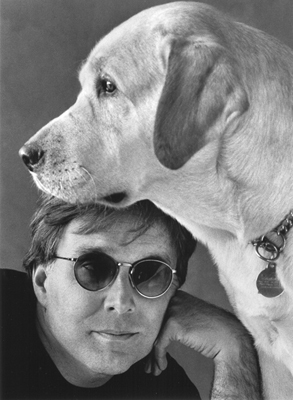 For all I know dogs may have poetry—sonnets of smell—amusing to think so—but when I took my first solo walk down the subway stairs with guide dog Corky I knew she had a bold and ancient comprehension of our circumstances. When you feel the language of others, even when its silent, you’re sensing competence. Some days a silent language is all you need. Once, riding a train from Helsinki to Tampere, I sat beside three old women. They knew one another well. You could see it in their postures, long familiarity. One was knitting. One had a book. The third looked out the window. Every now and then one of them would say a confirmatory thing—“snowing again” or “coffee?” It was easy to be in their company. I was a young man writing poetry and starting to understand the delicacies of language and consciousness. With a dog you don’t have to be all tricky and wild. Trouble free words will do. Heartfelt silence will do. Walking through the subway with Corky I let her guide me and kept my mouth shut. This entry was posted in Have Dog, Will Travel and tagged Dog, dogs, guide dog, Guiding Eyes for the Blind, Have Dog, Will Travel, language, poetry by skuusisto. Bookmark the permalink.